Marjolin’s ulcer is part of a group of neoplasms arising in chronic skin lesions, whether inflammatory or traumatic. Squamous cell carcinoma is the most frequently reported in the literature, it appears most frequently in burn scars, although also described in other types of lesions. We report a case of Marjolin ulcer in a male, native, 65 years old, from the Paraguayan Chaco, with antecedents of scar post trauma in youth. In 1828 Jean Nicholas Marjolin described the chronic burn ulcers called chancroid without establishing what this meant. It is because of Da Costa, by the year of 1903, the term Marjolin ulcer was used to describe the malignancy of a chronic ulcer that originates in the scar of a burn, but also described association of this entity with other etiological factors as decubitus ulcers, osteomyelitis and immunization scars [1,2]. Male patient, 65 years of age, indigenous, works in a farm, from Bahia Negra, Paraguayan Chaco. One year of evolution of an injury in the back of left leg over a traumatic scar from youth. Progressive growth and ulceration 6 months ago. Occasional itching. Casual night feverish feeling. Admitted at the Indigenous Hospital with presumptive diagnosis of leishmaniasis. Personal and family medical history: longtime smoker. No other evidence of value. Physical exam: Ulcerated tumor composed of irregular and indurated erithematoviolaceous edges, background with foul-smelling discharge, 10 x 7 cm left popliteal settles (Fig. 1), pale skin and tumor of 3 cm in diameter, well defined, consistency elastic solid, not adhered to deep planes in left inguinal region, consistent with lymphadenopathy. Presumptive clinical diagnosis: squamous cell carcinoma. Cutaneous Leishmaniasis. Chromomycosis. Sporotrichosis fixed plate. Paracoccidioidomycosis. Auxiliary Diagnosis: Hb 10.6, Hct 32 %, WBC 4500, N 73 %, L 20 %, Eo 7%, platelets 180.000, urea 32, Creat 1.3, simple urine: normal. Montenegro reaction: negative. Leishmaniasis IgM: negative. Sputum for AAR: Negative. Histopathology: epidermal continuity solution based on which appears a neoplastic proliferation of epithelial origin. The bottom of the sample is formed by fibrous connective tissue devoid of skin appendages and vessels are arranged perpendicularly. There are atypical cells in cords and solid nests with individual keratinization and in the form of corneum pearl shaped. 2/HPF mitotic index (Fig. 2a, b). Final anatomopathological diagnosis: Squamous cell carcinoma of intermediate grade of differentiation (grade 2), ulcerated, infiltrates lateral margins of resection and respects the deep surgical margin of the biopsy. Not observed vascular invasion, lymphatic or perineural into this sample. Culture for common germs and fungi: Negative. Bone radiograph: There was no bone involvement. Ultrasound of soft tissue was also requested which was not performed. Based on clinical and histopathological findings is concluded as final diagnosis: Squamous Cell Carcinoma of Marjolin ulcer type. background with necrotic tissue, granulation tissue areas with foul-smelling discharge, net limits of 10 x 6 cm that sits on a burn scar in left popliteal level. Pale adjacent skin. Figure 2. Histopathology. Epidermal ulcer. In the base there is a large proliferation of neoplastic epidermal cells. In A.D. Celsus was the first to mention, in 1828 Jean Nicholas Marjolin described the chronic ulcers burns, ulcers called chancroid without establishing what this meant. It is because of Da Costa, by the year 1903, the term Marjolin ulcer was used to describe the malignancy of a chronic ulcer that originates in the scar of a burn [1,2]. 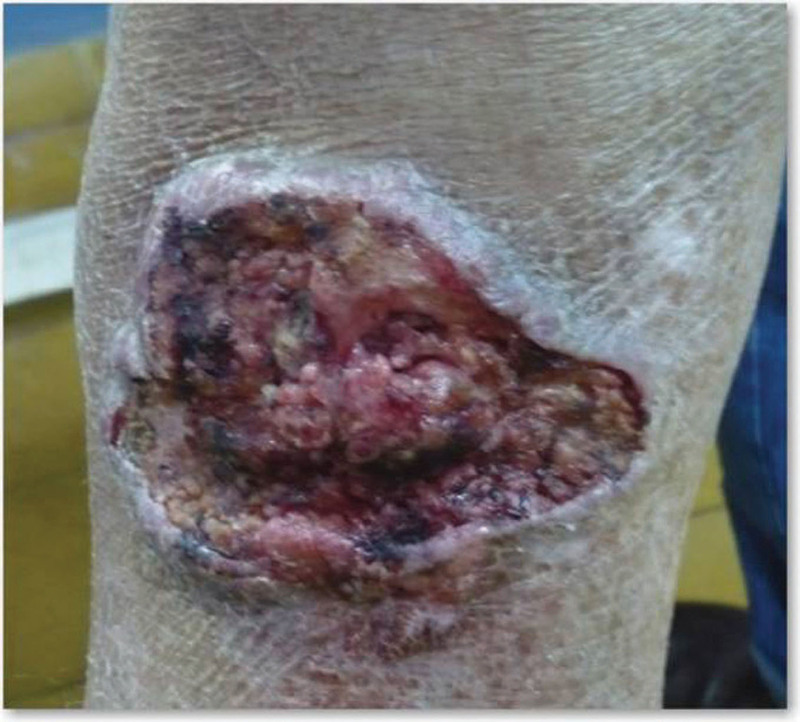 Carcinomas are developed in chronic wound scarring such as burns (2% incidence), pressure sores (0.5% incidence), venous ulcers and hidroadenitis supurative [1-3]. The mechanism by which malignant transformation occurs is not known, several theories have been postulated, one of which suggests that the toxins released into damaged tissue act as carcinogens, it has been postulated that repeated cycles of irritation, ulceration and tissue repair lead to malignancy. It also has been suggested that chronic damage would lead to a local deficit of nutrients, producing an epithelial carcinogenesis unable to resist the radiation produced in addition to tissue hypoxia, decreased immunity and repeated micro trauma tissue [2,4-8]. The incidence is unknown. 2-3% of squamous cell carcinomas developed in burn scars. The male to female ratio is 3:1, and the age range is from 18-50 years, is most common in the extremities (60 %), especially lower, head and face (30%) and trunk (10%) [2,8,9]. The most common histological type is squamous cell carcinoma (87%), followed by basal cell carcinoma, other histological types, such as melanoma or sarcoma are less frequent [2,6,9]. There are two styles: early malignancy: with a range of 4 months to 1 year of wounding. Slow evolution: with a range of 1-75 years. The malignancy may manifest clinically by increased pain, discharge, or bleeding, and warty appearance of the edges of the lesion. Epidermoid carcinoma of Marjolin ulcers is more aggressive and more prone to develop metastases through lymphatic pathways. The frequency of metastasis at 5 years is close to 40 % [2,6,7,9,10]. The main diagnostic tool is the histological study. Radiography is used to assess bone involvement, and magnetic resonance imaging to assess commitment to deep parts [2,11]. Treatment consists of surgery with safety margins of 4-6 mm and cures allow up to 90% of the cases. Mohs micrographic ablation has cure rates of 99% in five years. Cure rates down to 70% for tumors larger than 2cm. When there are palpable nodes is recommended a FNA or excisional biopsy with frozen section to determine behavior. The recurrence rate after radical surgery is 15%. Radiation therapy is an alternative to surgery if it cannot be done, does not accept the patient or as adjuvant therapy in cases of large carcinomas, poorly differentiated, deep or recurring [2,4,7,11,12]. Marjolin’s ulcer is a rare neoplasm characterized by a long latency period and increased local aggressiveness. The early and aggressive surgical treatment allows better control of this entity and prevent relapse. Early detection of this disease lies in the clinical suspicion. 1. Soto B, Cortés A, Bandera A, Luna K, Padilla A. Neoplasia maligna en cicatriz de quemadura: úlcera de Marjolin. Informe de dos casos y revisión de la literatura. Cir Ciruj. 2008;76:329-31. 2. Valdivia Z, Galarza V, Tolentino J, Hipólito M, Delgados V. Úlcera de Marjolin en cicatriz de drenaje de absceso mamario. Folia Dermatol Peru. 2008;19:127-9. 3. Pérez L, Elgueta-Noy A. Úlcera de Marjolin. Rev Chilena Dermatol. 2007;23:66. 4. Aronés Nieto B, Dávalos L, Guerrero Ciquero W, Mora Munares P, Alva Muñoz J. Post traumatic squamous cell carcinoma of fast evolution. Case report. Dermatol Peru. 2007;17:197-202. 5. Etufugh C, Phillips T, Goldberg L, Jensen S. Squamous Cell Carcinoma. Wounds. 2005;17:321-6. 6. Martínez D, Villalba V, Molina J, Salvador J. Úlcera de Marjolin sobre una úlcera venosa crónica: revisión de la bibliografía y comunicación de un caso. Angiología. 2006;58:63-6. 7. Zagne V, Mesquita A, Ferreira R, Fernandes N, Cuzzi T, Piñeiro J. Marjolin’s ulcer: a twelve-case report. An Bras Dermatol. 2006;81:355-8. 8. Guenther N, Charalambos M, Braumann C, Buettemeyer R. Squamous cell carcinoma arising on a skin graft 64 years after primary injury. Dermatol Online J. 2007;13:27. 9. Sabin SR, Goldstein G, Rosenthal HG, Haynes KK. Aggressive squamous cell carcinoma originating as a Marjolin´s ulcer. Dermatol Surg. 2004;30:229-30. 10. Pérez L, Elgueta-noy A. Úlcera de Marjolin. Rev Chilena Dermatol. 2007;23:66-73. 11. Tank J, Scharschmidt T, Weiner SD. Development of Bilateral Lower Extremity Marjolin Ulcers After Childhood Burns. Am J Orthop (Belle Mead NJ). 2008;37:E113-5. 12. Ogawa B, Chen M, Margolis J, Schiller FJ, Schnall SB. Marjolin’s Ulcer Arising at the Elbow: A Case Report and Literature Review. Hand (N Y). 2006;1:89-93.